Let me say it upfront: I consider myself a curatorial junkie. Since the mid-1990s, I began consuming what became a sudden surge of conferences and publications on exhibition history that addressed the ways in which art interpretation owes much to its forms of display. Position papers and essays presented in those platforms also argued that innovative contemporary curatorial practices have shaped new exhibition formats, and that some of these have even impacted the way art institutions redefine their cultural tasks. Many more of the thesis presented therein attempt to define what a curator is. On this subject alone, descriptions abound. Depending on their background and vision, their motivation and projects, their degree of openness or hermeticism, their context or audiences, a curator may be: a historical researcher; an arts producer; a cultural broker; a political activist; a philosopher, theorist or translator; an events organizer; some kind of social worker; and just about any combination of these except a taste-maker alone. Not that the most common kind of curator has disappeared –that whose specialty most often lies in an art genre, artist or artistic movement of a given time period, geography or nationality, and whose role is generally to authenticate, select and care for its corresponding oeuvre. It’s just that the field has significantly changed. And it’s just that longstanding institutional spaces are not the only sites of encounter with art. An increasing number of temporary and independent projects have emerged in the last decades, all requiring artistic directions and engaging curators. To name a few, consider site-specific exhibitions, public art festivals, biennales and other event-based forums, even publication-based projects. Again, most of these developments in curatorial practice have been written about and theorized in conferences and books, which tend to be anthologies gathering a combination of historic and commissioned texts. It is seldom through articles published in art magazines and essays in scholarly journals. This is why the recent launch of The Exhibitionist is so promising. Edited by Jens Hoffmann, this journal is devoted to exhibition making. It is openly made by curators, and for curators. With an intention to be published twice a year, the journal promises continuity, that is, to raise questions, share processes, and address issues pertaining to curatorial practice consistently. For this last reason alone, I am already a fan. In the editorial for The Exhibitionist inaugural issue, released in January 2010, Hoffmann points as its primary inspiration the French journal Cahiers du cinéma (f. 1951). The editor, a long-time independent curator and most recently institutionally affiliated—Hoffmann is the director of the CCA Wattis Institute for Contemporary Arts in San Francisco—intends to position the work of the contemporary curator along the lines of what Francois Truffaut called the auteur filmmaker in 1950s. Certainly, Hoffmann is not thinking any curator’s work could be that of an auteur. He believes, however, that the act of exhibition making, a critical and creative endeavor, does develop and puts out there a language of its own. 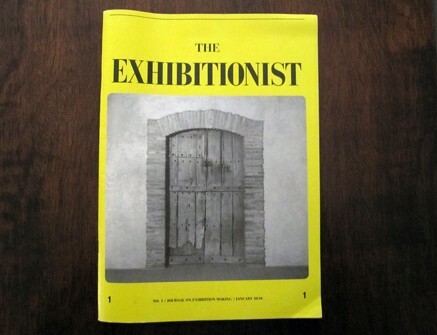 The Exhibitionist commissions personal essays about influential exhibitions to curators in the field; scholarly approaches to historic exhibitions; various assessments on a current major exhibition; a section called Typologies examines a specific exhibition format (the first issue focuses on solo shows); another tackles with exhibition making; one more features curators writing one of their own recent projects; and lastly, a brief text addresses contemporary curatorial practice—along the lines of the auteur figure that the journal editorial board intends to articulate. The first issue of the journal is great, and much expected is the next. This was originally published in the magazine Celeste (Mexico, summer 2010).